Up to this point, her films had occasionally used music as a fragment of the montage ensemble. The early I Cat, for example, includes bursts of a mediaeval French song and Inuit imitations of animal noises. Parker herself plays the cello in En Route, as one of that film's performative actions. Later, the composer Max Eastley contributed a subtle soundtrack to the aquarium section of The Pool, although the 'natural' sounds in that film - such as the sound of moving bodies in the dance scene and of water in the swimming pool - are also semi-musical counterpoints to the image. More recently however, in short works from 2000 to the present day, Parker has focussed directly on this relationship of music and film. The cello makes up a second body within the films. 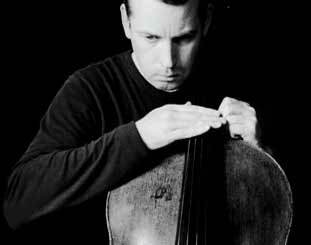 In Foxfire Eins, by Helmut Oehring, the cello is plucked and struck by both hands to play the abrupt and percussive score. Another contemporary composer, Volker Heyn, requires the cellist to play with two bows - one on the underside of the strings - for Blues in B-Flat. "The film opens in a music repair shop and we see the interior of the cello - the space where music resonates" (JP). In Projection 1, by Morton Feldman, the graphic lines of the cello and strings, crossed by the moving bow, "mirror the graphic score from which this piece is played" (JP). The piece is played twice, seemingly without a break. In an illuminating essay on music and Jayne Parker for the catalogue 'Filmworks 79-00' (Spacex 2000), the painter Joan Key wrote that "Parker's films use slight dislocations of angle and viewpoint, like a cubist painting, to open up performance's continuity to speculation." This is thematized by a sequence in which the close-up bow cuts a diagonal line across an empty screen, in a dialogue between vision, motion, flatness, space, sound and picture. Repetition is differently treated in 59 1/2 Seconds, by John Cage. Parker shot and edited several versions of this one-minute composition, and in projection they can be cut together in different orders. Because they repeat the music, and compel repeated viewings, these two films are more easily shown in gallery installation, as they were for screenings in 2000/1 at Spacex (Exeter), John Hansard Gallery (Southampton) and the Aldeburgh Festival, as part of a comprehensive tour of Parker's exhibition Foxfire Eins. The most recent film in this series returns to Stefan Wolpe, with Stationary Music (2005), featuring his Sonata 1 of 1925, again played by his daughter Katharina. This is a strong and spiky but intricate and 'formal' piano work, as the title indicates. A flat wall panel behind the pianist's concentrated face, and stark angles of construction throughout, seem to echo the bauhaus-cubist culture that stands behind the music, just as inserted shots of a magnolia bud and a flowering branch subtly insist on the organic element in abstract sound and imaging. As with the earlier music films, the continuous flow of sound is shown in related visual fragments built around the gesture and movement of the performer. The film performance appears uninterrupted, but is in fact the product of many shots taken with a single camera, so that the rhythms and counterpoint of the editing also imply or point to the film's construction as a process in time. In their purity and intensity, these highly figurative films are both portraits and lyric abstractions.